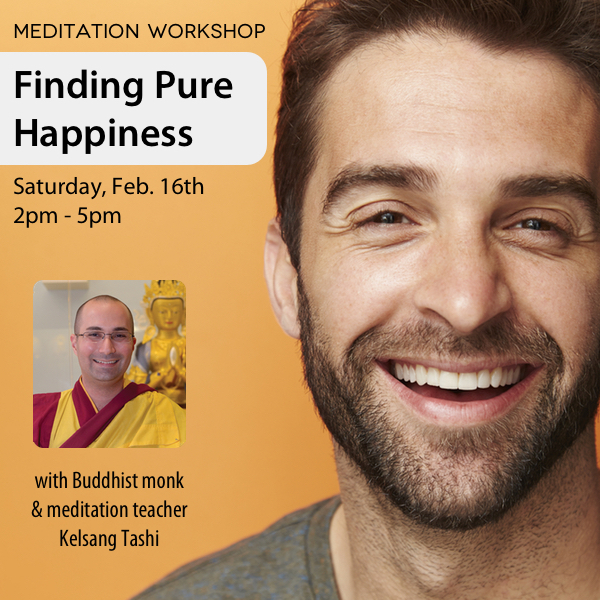 During this workshop we will learn how to develop and maintain pure happiness, both in meditation and during our everyday activities. Pure happiness is happiness that comes from a peaceful and positive mind. We will explore special meditations and ways of thinking that make our mind more peaceful, joyful and inspired. Through learning how to carry the positive experiences and insights we gain in meditation into our daily activities with mindfulness, we will be able to keep a light and positive mind all the time. Everyone is welcome. No previous experience necessary. This workshop includes two sessions of practical teachings and guided meditations with Buddhist monk and meditation teacher, Kelsang Tashi. Kelsang Tashi is a Buddhist monk and the Resident Teacher of Kadampa Meditation Center Miami. He has been practicing meditation in the Kadampa tradition for over 10 years. His gentle approach to meditation emphasizes the importance of keeping a happy and positive mind. He is appreciated for his clear, light-hearted and practical presentation of Buddhist teachings. Cancellation Policy: If you cancel 24 hours prior to commencement of the event we will refund all except 25%. If you cancel on, or after, the event, no refunds are given. Exceptions may be made in circumstances such as sickness or bereavement; you should apply by e-mail to ad@meditationinmiami.org within 2 weeks of the end of the event. Any non-refunded fees arising from cancellations are donated to the NKT-IKBU International Temples Project.